The cost of compressor ownership varies substantially based on a number of criteria, not just the purchase price. It would be wise to know in advance all of the cost. Here is information about the many costs associated with compressor ownership. Compressor buying trends indicate that for a general purpose industrial air compressor up to 20 HP folks select a reciprocating unit which are lower cost units than rotary screw or rotary vane type compressors. For more demanding industrial applications, and in a wide range of available horsepower, the rotary screw seems to be the next most popular type of industrial air compressor. The rotary vane, while still prominent, appears to be selected for specialty applications more often than the first two. If we ignore the time you spend on researching a compressor purchase, your first cost of compressor ownership is, of course, the purchase of your air compressor. What you are using your air compressor for, and the discharge flow rate and pressure needed for your applications will determine what size and type of compressor is required. See the pages on this site about buying an air compressor for help in determining what size compressor you need. The rule of thumb in industry is that for compressors over 10HP in size, each motor horsepower can generate about 4 CFM of compressed air at 90 PSI. After purchasing or leasing the compressor, next on my compressor ownership cost list is the maintenance of the compressor. After the warranty period, who is going to fix the compressor when it goes down, because it will, eventually? Will it be your staff, the compressor supplier, or a third party maintenance group? What are their labor costs, and what hours are expected to be consumed in both regular maintenance and emergency repair. Not all compressor maintenance costs are the same. Worth checking out before selecting a compressor, for sure. Included in the maintenance part of the equation is the cost of the spare parts for regular maintenance, and parts costs for emergency repair. The major compressor manufacturers will be able to provide a forecast of annual maintenance costs, the sum of which might help you decide to purchase a more expensive yet more reliable compressor, which will then, one would hope, provide you with lower compressor maintenance cost over the life of the unit. One expense that will ultimately overwhelm all other cost considerations for most industrial compressor applications is the cost of operating that compressor. Since the vast majority of industrial air compressors in plants run on electricity, the details below will help you determine the operating cost of the unit you are considering purchasing. There are many formulas available to help determine your operating costs. We will offer a simplified version. If you seek greater detail a couple of sources are noted below for you as well. Reference finding the electricity costs per KWh, if you do not pay the bills at your company, ask the accounts payable person to check on your last company hydro bill. Make sure that delivery costs, etc. are included in the kWh amount. Annual run time is the number of hours per day, times number of days per week, times 52 weeks a year, resulting in a number of hours per year. Motor efficiency information should be available from the compressor manufacturer. In the absence of that information, work on the basis of 90% efficiency or see if this information is noted on the compressor motor plate. If your compressor runs all the time, and only compresses air part of the time, the time it is actually compressing air is the load factor. When it is running unloaded, the motor will use less energy. If you are contemplating a compressor that only runs when it is compressing air, the load factor would be 1. If in doubt, use a load factor of 0.8. That should suffice for most applications. Here’s what the simple formula to calculate your compressor operating cost looks like. Let’s throw a few numbers at it, shall we? Next is a chart with the numbers for our theoretical compressor application, from which you may be able to extrapolate costs to your compressor of choice to determine the operating cost. Here’s the formula referred to earlier, now with our theoretical application numbers plugged into the formula. When you do the math, you’ll see that this 50 HP compressor, will cost $4,887.00 per year in energy operating costs! This page has been up on this site for many years now. Today, electricity cost of $0.12 / kWh or even more may be more appropriate. 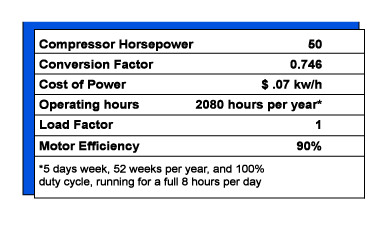 At $0.12 / kWh this compressor will cost about $10,000 per year to run, based on the hours of use shown in the example. Use this method of calculating a compressor operating cost and then compare that to the purchase price of a compressor. See how important compressor running cost is to know up front? We know you’ve a real interest in reducing operating costs. You’ll want to know that typically more than10% of a compressors compressed air output is wasted through folks using your air for other than it’s desired use, or leaked from your system. Save significant cost every year by curtailing air waste, and ridding your plant of air leaks. Use leak detector equipment to find and stop air leaks on a regular basis. The payback can be substantial. It is possible to provide a significant amount of heat for your plant from your compressor. Since you want the air going into your plant to be as to cool as possible, a heat exchanger / aftercooler might be a way to recapture the compressor heat for reuse. ‘Nuff said on this topic by me. Compressor heat reclamation is best left to the experts, of which I sure am not. Just Google “compressor heat reclamation for a host of sites to help you. Other sources for information about the cost of running a compressor are the IR/ARO site, and also, some excellent information can be found at the Kaeser Compressor web site. Compressor costs will escalate along with your compressed air requirements. More compressor cost information and and compressor sizing data can be found on this site.